Key deer, photographed at Key Deer National Wildlife Refuge, No-name Key, Monroe County, in December 2013. 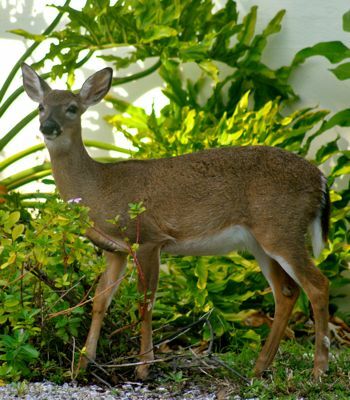 Florida's white-tailed deer tend to be smaller than their counterparts elsewhere in North America. Key deer, Odocoileus virginianus clavium, are the smallest of the small. 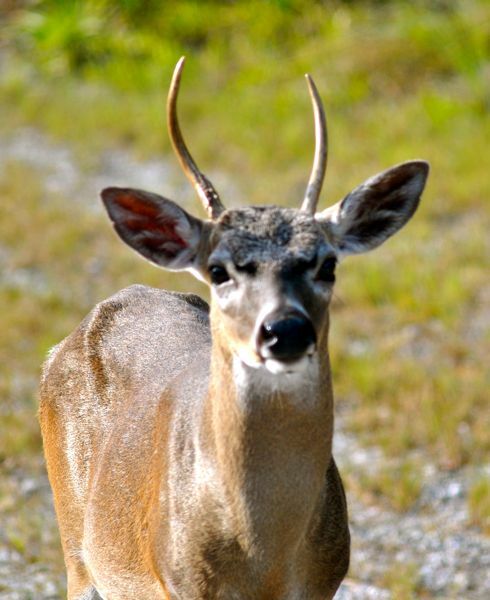 A typical buck in Palm Beach County might weigh 125 pounds; a Key deer buck will weigh 75 pounds. 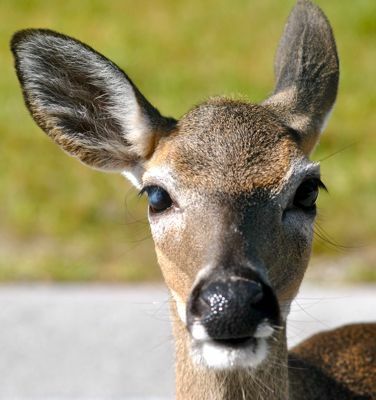 Key deer, so-called because they're found only in the Florida Keys, are actually a subspecies of the white-tailed and are listed by the federal government as endangered. Fittingly, they're the smallest subspecies of white-tailed deer in terms of numbers. Their range includes 26 islands from Big Pine Key to Sugarloaf Key, with Big Pine and No-name Key hosting most of the population. During the dry seaon, the range shrinks to 13 islands that have supplies of fresh water. And yes, they do swim between the islands. 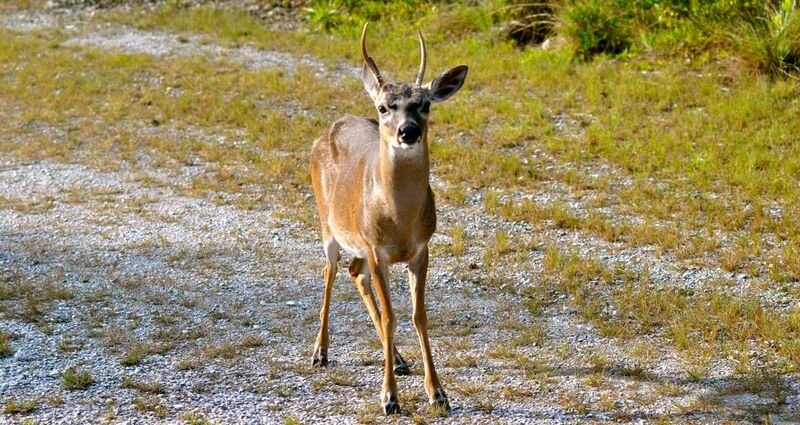 Key deer are believed to have migrated to the Florida Keys during the last ice age when sea levels were low. When the ice melted, and sea levels rose, the deer population was cut off from the mainland. They adapted to their limited surrounding by evolving into the small-bodied animals we see on the islands today. They're found in every habitat the lower Keys have to offer: rock pinelands, hardwood hammocks, mangroves and wetlands. But they're not shy creatures and readily move through human occupied areas in search of food, though not without cost: encounters with cars and trucks are their leading cause of death. Before humans arrived, the Keys were a relative paradise for the deer; there were few predators or competitors for resources. With the arrival of humanity, especially the European variety, came hunting and then over-hunting. Florida banned hunting in 1939, but the slaughter continued until the 1950s, when by some estimates, only 25 Key deer were alive. The feds establishing the Key Deer National Wildlife Refuge in 1957 and passed the Endangered Species Act a decade later, helping to reverse what appeared to be an inevitable slide toward extinction. The Key deer is still listed as endangered, but the population has grown to roughly between 600 and 800. Habitat destruction and fragmentation, illegal dumping, dogs, poaching and even invasive plant species are threats. Invaders such as Brazilian pepper crowd out native species that the deer rely on for food.Traffic remains a major problem, and lurking down the road is sea level rise. Rutting (breeding) season for Key deer begins in September and peaks in October but can continue as late as February. Gestation is 204 days, with females generally giving birth to a single fawn in mid- to late-spring. Fawns on average weigh two to four pounds at birth, and they're able to follow their mothers within an hour or so. They'll nurse two or three times a day, spending the rest of the time bedding; at two weeks, they spend more time with mom; by four weeks, they begin moving more independently. Most year-old bucks won't breed but many year-old does do. According to the U.S. Fish and Wildlife Service, a buck usually will have antlers by their second year; by their fourth year, they typically produce eight points. An adult male Key deer will weigh 75 or 80 pounds, while an adult female will be about 65 pounds. 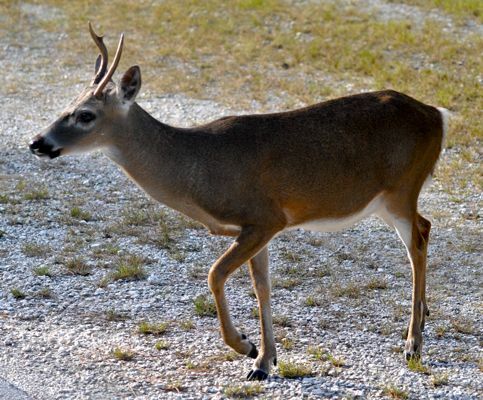 Key deer tend to be less social than other white-tailed deer but also not as territorial. Males will keep intruders away from a receptive female but don't guard specific areas. So what makes a good meal for a Key deer? Red and black mangroves are about a quarter of their diet. Also on their menu: acacia, Keys blackbead, palms, grasses and mulbery among 160 or so plant species. They also munch on ornamentals. Oddly fire, actually the lack of fire, is another problem for Key deer, since many of the plants they eat in some way require burnings to grow or thrive. Spend any amount of time on Big Pine, or No Name, and you're bound to run into a Key deer sooner or later. Hopefully not literally. Both islands are part of the Key Deer National Wildlife Refuge. Traffic rules there are designed for the safety of the animals.